ATHENS (Reuters) - Greece will need to tap all the remaining cash reserves across its public sector -- a total of 2 billion euros ($2.16 billion) -- to pay civil service wages and pensions at the end of the month, according to finance ministry officials. Barring a last-ditch deal with its creditors, that is likely to leave no money to repay the International Monetary Fund almost 1 billion euros due in the first half of May, although Greece has said it wants to honor its debt obligations. Athens' scramble for basic funds shows how extreme the financial constraints on Greek Prime Minister Alexis Tsipras have become as he tries to convince skeptical foreign creditors to extend his country new financial aid. Greece's finance ministry denied that it would need to tap remaining cash reserves to meet salary payments, without providing any figures. "News agencies' reports that refer to the state's cash reserves are groundless, we categorically deny them," the ministry said in a short statement on Friday. 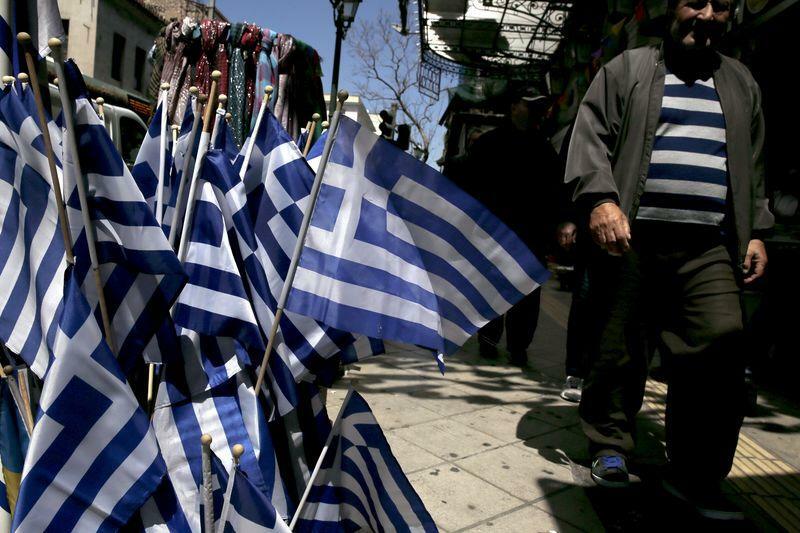 Officials from Greece and the lenders are meeting in Brussels on Saturday for a new round of negotiations ahead of a key euro zone finance ministers' meeting in Riga on April 24. "This is the last bit of cash that the Greek state has," a senior finance ministry official, who requested anonymity, told Reuters. Euro zone officials have voiced scepticism about previous Greek warnings of empty coffers, although even they acknowledge a crunch is nearing. The Bruegel economic think-tank said in an analysis that the government's financial assets could buy it more time. "Given the huge stock of financial assets the Greek government has, I am always cautious about reports that it will soon run out of cash," Bruegel analyst Zsolt Darvas wrote. For months, the government has been borrowing from different parts of the state administration, including the Athens subway system, to pay the wages and pensions of public sector workers. Now, however, it is reaching the end of the line. Finance ministry officials say the state's cash balance will be negative from April 20 if the government does not extract the 2 billion euros in cash deposits remaining in various public bodies, including a handful of pension funds and regional administrations. Without that money, the state would be 1.6 billion euros short of what it needs to pay month-end salaries and wages. Regular tax revenues, which start flowing in early in the month, should help the state's financial position of course. Tax revenues had begun to slip early in the year, when Tsipras' government was elected, but have stabilized since to around 4 billion euros a month. Still, the financial pressure will not subside because Athens faces a new round of payments to the IMF next month. It needs to give the IMF 950 million euros by May 12 -- then domestic commitments kick in once again. Tsipras is hopeful he can convince Greece’s creditors to unlock the funds Athens needs to prevent default and a possible exit from Europe’s single currency. To do that, he needs to present detailed plans to reform the economy, including the labor market and pensions system. International creditors have so far deemed Athens' offerings inadequate. But the leftist prime minister is also keen to keep far-left factions of his party at bay by sticking to a hardline stance on rolling back years of austerity that has impoverished Greece. Tsipras told Reuters on Thursday he was optimistic for a deal. But he also said that there was still discord on four key points – including the key issues of labor and pensions. Without a political agreement with the euro zone next week, Athens is likely to have to choose between making wages and pension payments to its people or reimbursing the IMF. "Our aim is to be able to fulfill our obligations", Deputy Finance Minister Dimitris Mardas said when asked on Thursday if Athens could pay wages and salaries in April and make IMF payments in May. "I don't want to say that we are comfortable (on wages and pensions) but nor do I want to spread panic." Athens has already relied on various one-off expedients to tide it through the cash crunch so far. It tapped 555 million euros of commissions paid by Greek banks into the Hellenic Financial Stability Fund, the state bank rescue vehicle, last month. A tax amnesty introduced in March that waived fines for people with tax arrears if they paid up quickly brought in 147 million euros in eight days, another boost to the coffers. Mardas also acknowledged on Thursday the state had postponed payments of about 600 million euros to suppliers, without touching spending on essential items like hospitals and wages. The most popular technique so far has been the use of repo transactions in which a state entity sitting on cash lends the money to the government for up to 15 days through a short-term repurchase agreement, which can then be rolled over. Athens now has 10 billion euros in outstanding repurchase transactions, though some of that stemmed from before Tsipras took power, the first official said. More recently, the state used 200 million euros from a fund that disburses EU subsidies to farmers in repos, a ministerial decree shows. The employment agency also disclosed it had lent the state 120 million euros, seeking to reassure Greeks in a statement that unemployment benefits would be paid before last weekend's Orthodox Easter break. Another big chunk came from the Athens subway system, which lent 400 million euros to the state. To tap the remaining 2 billion euros from the pension funds and regional administrations, the government would have to put pressure on them to lend the money via new repo transactions. The alternative would be a ministerial decree, one of the financial officials said. Such a move could prompt loud complaints from opposition parties in parliament.